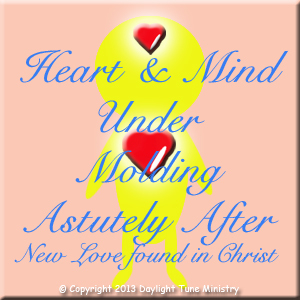 Our inner spirit is found in Christ. Christ is the Saviour of our soul. Experience Christ’s love enables us to love Him back. Love the Lord with all our hearts, mind, and strength. Worship Him through actions and words. The challenge to define the acronym of HUMAN is the heart keyword. The Creator gives us heart and mind to know and experience His love. Posted in Acrostic, Poetry and tagged Action, Bible, Christ, Experience, Genesis, God, Holy, Jesus, Lord, Love, man, Mankind, Mold, Saviour, Scripture, Son, Spirit, Under, woman, Word, Worship. Bookmark the permalink. In the beginning was the Word, and the Word was with God, and the Word was God. The same was in the beginning with God. All things were made by Him; and without Him was not any thing made that was made. In Him was life; and the life was the light of men. And the light shineth in darkness; and the darkness comprehended it not. There was a man sent from God, whose name was John. The same came for a witness, to bear witness of the Light that all men through him might believe. He was not that Light, but was sent to bear witness of that Light. That was the true Light, which lighteth every man that cometh into the world. He was in the world, and the world was made by Him, and the world knew Him not. He came unto his own, and His own received Him not. But as many as received Him, to them gave He power to become the sons of God, even to them that believe on His name: Which were born, not of blood, nor of the will of the flesh, nor of the will of man, but of God. And the Word was made flesh, and dwelt among us, (and we beheld his glory, the glory as of the only begotten of the Father,) full of grace and truth. John bare witness of Him, and cried, saying, This was He of whom I spake, He that cometh after me is preferred before me: for He was before me. And of His fullness have all we received, and grace for grace. For the law was given by Moses, but grace and truth came by Jesus Christ. No man hath seen God at any time; the only begotten Son, which is in the bosom of the Father, He hath declared Him. Feeling under appreciated by my younger brother who refused to drink the cooling tea, my mind wonder how my Lord Jesus Christ feels when He was rejected by so many people. 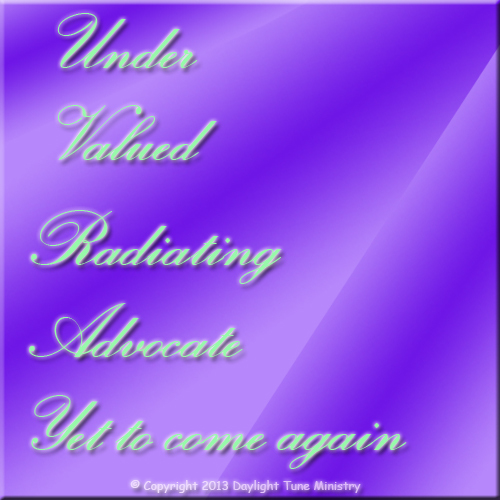 Posted in Acrostic, Poetry and tagged Advocate, Again, Appreciated, Brother, Christ, Come, Feel, God, Holy, Jesus, Lord, mind, Radiate, Rejection, Son, Spirit, Under, value. Bookmark the permalink. Suddenly, the words “Being Under Stress” came. Then the word “Yoke” seemed the best choice of expression as I was checking prayerfully from the dictionary hoping for the Lord to help and guide me. Indeed, God is my Help and Guidance. Glory to God. Posted in Acrostic, Poetry and tagged Being, Stress, Under, Yoke. Bookmark the permalink.